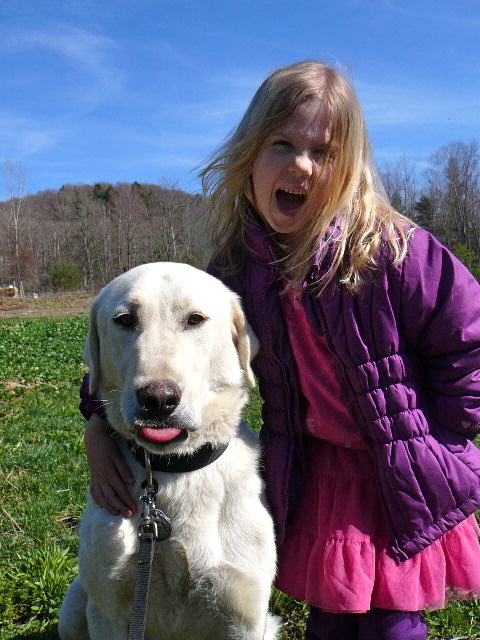 Derin sticks his tongue out for the camera while Rowan expresses her delight at our newest family member. Our farm sits nestled in a region of NY blessed by large tracts of forested land, including Shindagin Hollow State Forest. We celebrate sightings of bobcats, fisher cats and many other weasel family relatives, black bears, coyotes, hawks, owls, and more. The return of large predators to this area is exciting… except when it means our farm is their buffet. While our love of nature and ecology is a large piece of what drew us to farming, our feeling of responsibility for the well-being of our animals is one of the main reasons we keep farming. We dreaded morning chores the past two seasons because more often than not we were walking into the aftermath of predation, and it was never pretty. And it was heartbreaking to lose the animals we nurtured so carefully to such casual violence. We tried highly charged electronet fencing, Nite Guards, snares, baited live traps, and even guard geese, but still we would lose birds more nights than not. We hope Derin’s presence (perhaps aided in the future by another guard dog) will draw a boundary around our place signaling to the predators to keep out. In addition to the emotional toll, we simply cannot build a profitable farm when we experience 50% losses of our poultry. This year we are getting our first sheep, and I suspect losses would be even worse once the local coyote population caught wind of their presence. We’ll see how Derin does bonding with sheep, since he’s really only known poultry. Hopefully his instincts kick in and we have a year with minimal losses. We’ll keep you posted! Derin is an adorable dog, especially with Rowan by his side. Congratulations on another big decision and step in the life at Shelterbelt Farm. What are the results with the dog after a year ? Derin did exactly as we had hoped, and our predation rate on our turkeys last season dropped to almost nothing (and the only reason we had any is because it took us a little while to learn how best to manage Derin). He spent the whole winter guarding our flock of sheep. But tragically, he was killed by a car last week, so we’re missing him and feeling quite vulnerable to predators this year. We’re not ready to get another dog yet, so we’re going to try guard geese for this season, and get another Akbash pup next Spring.